Atmospheric tides due to persistent tropospheric weather systems and their effects on the geospace environment, as observed by NASA's TIMED and IMAGE satellites. Click image for larger figure. 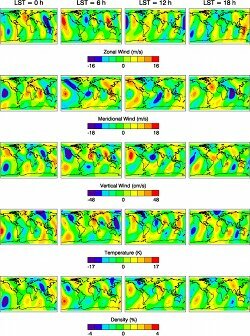 Diurnal and semidiurnal tidal temperature and wind perturbation at 100 km altitude for September 2005 as seen by the TIDI and SABER instruments on board the TIMED satellite. Click image for animation. Tidal perturbations due to upward propagating nonmigrating diurnal and semidiurnal tides at 250 km from empirical modeling of observed tides in the mesosphere/lower thermosphere. Results are shown as function of longitude, latitude, and local solar time (LST). Migrating tides are not included.Click image for larger figure. 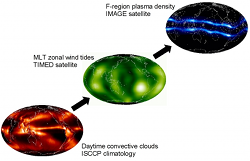 The space weather of Earth's upper neutral and ionized atmosphere is strongly influenced by high-latitude energy input due to magnetosphere-ionosphere coupling, and solar radiation variability. Recent observations and model simulations now demonstrate unequivocally that the geospace environment (here: ionosphere-thermosphere-mesosphere, ITM) owes a substantial amount of its variability to waves forced in the lower parts of Earth's atmosphere. An exciting new realization is that persistent tropical rainstorms produce large longitudinal and local time variations in bulk ITM properties: temperature, wind, density, chemical composition, airglow and plasma density, to name a few. Energy and momentum from the troposphere are carried upward by small-scale gravity waves and large-scale non-Sun-synchronous (nonmigrating) atmospheric tides. The result is a vertical coupling over more than 400 km in altitude. Tropospheric weather is hence affecting even regions of Earth's upper atmosphere where the ISS and many satellites are orbiting! There is a lot of interesting physics going on, involving dynamics, thermodynamics, chemistry, electrodynamics and their interaction. The induced geospace variability competes with the solar and magnetic driving from above. Consequences for telecommunications, re-entry and satellite operations still need to be explored. The extent to which the effects of this quiescent atmospheric variability are transmitted to the magnetosphere is yet to be resolved. Furthermore, as tides are closely linked to the parameterizations of radiative heating, convection, clouds and latent heat in current general circulation models (including climate models) they provide a sensitive means of evaluating and validating these parameterizations. Atmospheric tides and planetary waves are analyzed in the data from a variety of satellites: TIMED, EOS, CHAMP, TRMM and interpreted using physics-based empirical, mechanistic and first-principles modeling. The results contribute to a wide range of research projects and programs in close collaboration with national and international universities and research centers. Response of the Mesosphere/Lower Thermosphere to Tidal Variability Caused by the Madden-Julian Oscillation, NASA grant 80NSSC19K0258, 2019-2022. Life-Cycle of the Quasi Two-Day Wave, co-I, NSF grant AGS-1552176, 2016-2019. 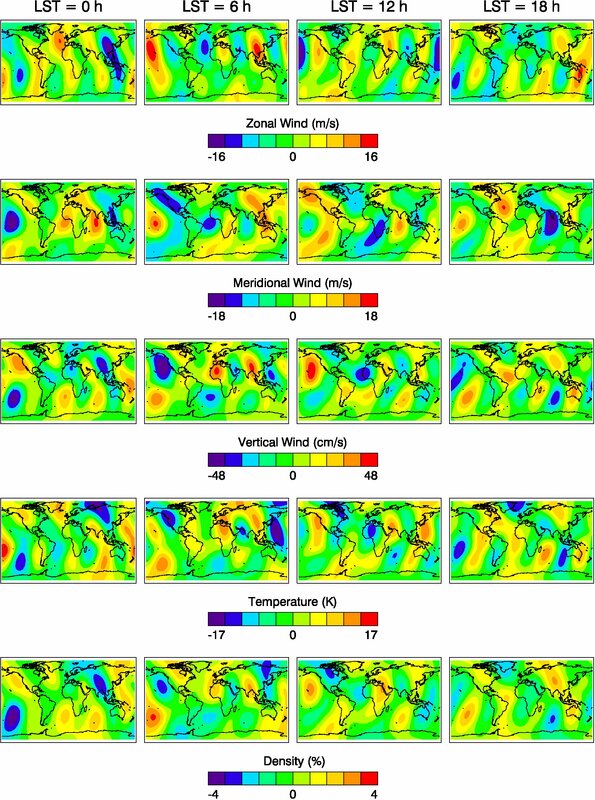 Short-term tidal variability from the troposphere to the dynamo region, co-I, NASA grant NNX15AJ02G, 2015-2019.